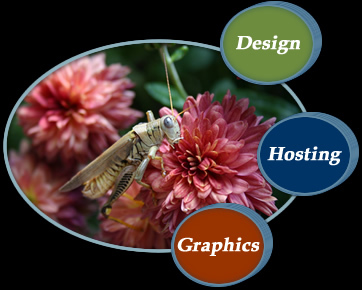 NC Web Designs offer custom website designs, graphics, digital photography and photo editing. Graphics can make or break a website. 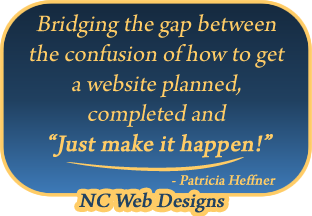 NC Web Designs can work with you to determine your needs for optimizing your company's brand and website presence. When you have a particular need, just let us know. Little jobs are not ignored! No job is too small. We can take your word processing document and create web ready content. Working around what a client needs makes life more fun! Web design requires attention to your business niche in detail, understanding Search Engine Optimization (SEO), while also providing a complimentary website design is key to a better website. Each and every website is unique. Your needs are addressed individually. Is content already prepared for the site or will it need to be created? Are there complex solutions needed? What are the layout and design needs? What are the number of pages the site will contain? Do you want to be able to edit your website? We will initially set up a call or meeting to discuss your needs. After that we can determine costs and send you a quote. Logo creations are at an additional cost. Maintenance plans are available. Hourly rates, monthly or yearly maintenance fees can be arranged. Hosting services can be set up for your website. If you already have existing hosting services, we can work with them as well. What is Web Site Hosting: Files for your website have to be stored on a server connected to the World Wide Web so that your clients can access the files from the internet. There is a fee for providing this, which is called Web Site Hosting. Do you need a domain name to set up a website? Yes, every website has a domain name. You will need carefully consider your name and we can provide solutions and recommendations. If you do not already have a name please contact us before doing so. This way we can make sure you consider optimization factors in selecting one.